The final Allied push towards the German border began on October 17, 1918. As the British, French and American armies advanced, the alliance between the Central Powers began to collapse. Turkey signed an armistice at the end of October, Austria-Hungary followed on November 3.
the High Seas Fleet stationed at Kiel mutinied on October 29. Within a few days, the entire city was in their control and the revolution spread throughout the country. On November 9 the Kaiser abdicated; slipping across the border into the Netherlands and exile. A German Republic was declared and peace feelers extended to the Allies. At 5 AM on the morning of November 11 an armistice was signed in a railroad car parked in a French forest near the front lines. 'Well - fini la guerre!' said Colonel Greely. 'It sure looks like it,' I agreed. My watch said nine o'clock. With only two hours to go, I drove over to the bank of the Meuse River to see the finish. The shelling was heavy and, as I walked down the road, it grew steadily worse. It seemed to me that every battery in the world was trying to burn up its guns. At last eleven o'clock came - but the firing continued. The men on both sides had decided to give each other all they had-their farewell to arms. It was a very natural impulse after their years of war, but unfortunately many fell after eleven o'clock that day. 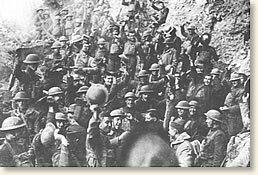 armistice that meant the end of the war. But at the front there was no celebration. 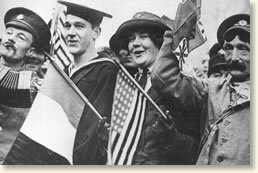 Many soldiers believed the Armistice only a temporary measure and that the war would soon go on. As night came, the quietness, unearthly in its penetration, began to eat into their souls. The men sat around log fires, the first they had ever had at the front. They were trying to reassure themselves that there were no enemy batteries spying on them from the next hill and no German bombing planes approaching to blast them out of existence. They talked in low tones. They were nervous. After the long months of intense strain, of keying themselves up to the daily mortal danger, of thinking always in terms of war and the enemy, the abrupt release from it all was physical and psychological agony. Some suffered a total nervous collapse. Some, of a steadier temperament, began to hope they would someday return to home and the embrace of loved ones. Some could think only of the crude little crosses that marked the graves of their comrades. Some fell into an exhausted sleep. All were bewildered by the sudden meaninglessness of their existence as soldiers - and through their teeming memories paraded that swiftly moving cavalcade of Cantigny, Soissons, St. Mihiel, the Meuse-Argonne and Sedan. What was to come next? They did not know - and hardly cared. Their minds were numbed by the shock of peace. The past consumed their whole consciousness. The present did not exist-and the future was inconceivable."